New Zealanders want a binding referendum on proposed End of Life Choice law. A HorizonPoll finds 68% say yes to having a binding referendum, 33% say no. 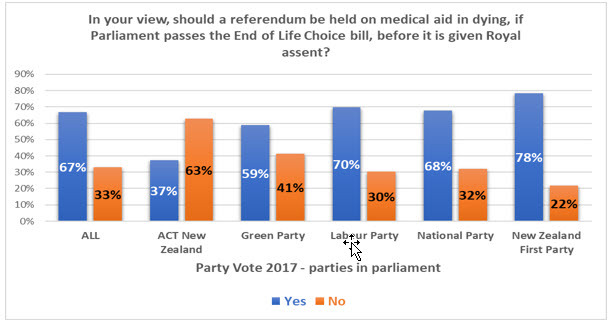 The result overwhelmingly supports a New Zealand First proposal to hold a referendum, which if agreed to will determine if its MPs support the End of Life Choice Bill. As proposed, the referendum would be held if the bill passes in Parliament but before it is given Royal assent to become law, and could determine whether Royal assent is given. The bill, expected to be reported back to Parliament by the Justice select committee on March 27 next year, would give adults with a terminal illness or a grievous and irremediable medical condition the option of requesting assisted dying. Labour, National, ACT and Green Members of Parliament will exercise a conscience vote on the bill. New Zealand First says its MPs will support the bill, provided it is subject to a binding referendum before it is passed. 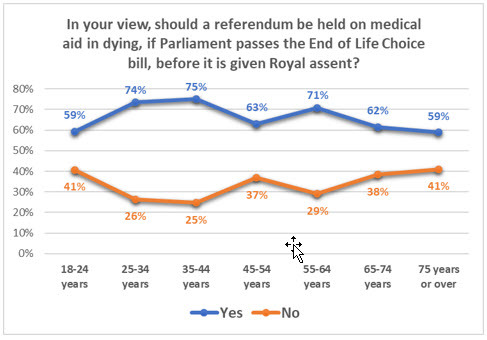 It then asked if a referendum should be held on medical aid in dying, if Parliament passes the end of Life Choice Bill, before it is given Royal assent. The 983 adult respondents were given a yes or no answer choice. Highest support for a referendum comes from those who voted for New Zealand First at the last general election (78% support, 22% oppose) followed by Labour voters (70% for, 30% opposed). ACT (63% against, 37% for). By occupation least support for a referendum comes from students (52% against, 48% for) and business proprietors and self-employed (44% against, 56% for). By age, highest support for a referendum comes from those aged 35-44 years (75% for, 25% against). Among those aged 65-74 support is 62%, lower than the population as a whole, with 38% against. Among those aged 75+, support is 59%, opposition 41%. One parent households are the most likely to support a referendum: those with one of two children at home by 79% to 21% and those with three or more children at home by 81% to 19%. The survey’s 983 respondents are members of Horizon Research’s national HorizonPoll panel, representing the adult population at the 2013 census. Results are weighted by age, gender, employment status, highest education, personal income and, to ensure political balance, Party Vote at the 2017 general election. At a 95% confidence level the maximum margin of error is +/- 3.1%. The survey was conducted between August 7 and 14, 2018. A November 2011 poll found 56% of the votes cast would be to not change the Mixed Member Proportional (MMP) voting system. 55.76% of votes cast supported keeping MMP, in preliminary counting. In 2015, Horizon had the most accurate poll results on the alternative New Zealand flag: just 0.17% out. Final results from the Electoral Commission released on December 15, 2015, said the Black, White and Blue Silver Fern flag, designed by Kyle Lockwood, won in the fourth round of voting with 50.58% of the vote. Horizon Research had the flag winning with 50.41% of the vote after four iterations: Just 0.17% out. You're welcome to comment at our Facebook page.